What are the differences between IMAX vs. Dolby vs. xD vs. RealD? You used to only be able to choose from a small, medium or a large popcorn at the movies, now you can choose how big you want your screen to be and how immersive you want your experience to be. From booming sound to stunning 3D imagery, many movie theaters now offer several choices and formats, as well as accompanying prices, to watch your movie. You can choose from just plain old “SD” or “standard” movie-watching or customize the best experience for you from IMAX to xD to 3D to Dolby and more. But what are the differences? Dolby Cinema™ makes every visit a captivating event. Dolby is defined by “astonishing brightness and breathtaking sound” as well as “deep darks and vibrant colors render each moment with spectacular impact.” Breathtaking sound that fills the room and flows all around you. At AMC theatres, that also comes with sleek power recliners reverberate with spectacular impact. Experience Dolby Cinema, where movies come to life. Dramatic imaging makes the action comes alive in a dramatically different image featuring spectacular brightness, vibrant colors, and deeper darks. You’ll feel like you’re in the middle of the story as the sound flows around you with breathtaking realism, to create a powerful sensory experience. IMAX is an immersive movie-going experience. 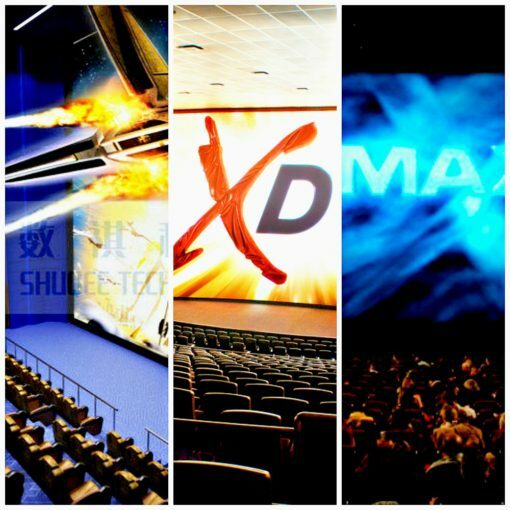 Every element in an IMAX® theatre is designed and positioned to create an intense experience. IMAX® ensures movie magic every time the lights go down. Bigger is just the beginning. Every element in an IMAX theatre is designed and positioned to create an intense experience. IMAX ensures movie magic every time the lights go down. IMAX includes heart-pounding audio. The combination of perfectly tuned, integrated sound system and precise speaker orientation ensures you can hear every note as clearly as ever, all inside a theatre that has been customized for an optimal experience. Inspiring Images: Clarity, detail, and scale made IMAX more than just a movie. Our remastering process completely transforms every frame, drawing you into something as close to reality as you have ever experienced in a theatre. Immersive Experiences: Every aspect of our theatres is designed to exact standards to create movie magic as soon as the lights go down. Remote monitoring, real-time system adjustments, and custom-designed theatres make IMAX a truly immersive moviegoing experience. Enjoy a unique and innovative visual experience, featuring incredible depth and clarity. It makes the movie look so real, you’ll want to reach out and touch it. Experience a Better 3D. With highly-sophisticated screens, capable of playing 2D and 3D pictures, and high-stereo contrast, RealD Ultimate Screens offer an experience to remember. ReadD’s TrueImage™ enhancement software restructures images, resulting in a more detailed, clear and crisp picture, bringing the filmmakers vision to life in the most vivid way. Cinemark offers an “XD experience”, which stands for “Extreme Digital”, which is essentially a souped up theater. Here’s what Cinemark says about the large format XD: “Our amazing XD auditorium has the largest screen in the building, and it’s wall-to-wall! State-of-the-art projector capable of 35 trillion colors! Custom surround sound with more speakers. You feel like you’re in the movie! How many calories are in a large movie popcorn from AMC, Regal and Cinemark? This gives me a really good idea for how the different companies view the differences between their tech and how it makes them stand out. This is a great resource for the first few steps in research I’m doing. I think you’re really on to something. If some insider views of the differences experienced were included, this article could be a go-to source for people looking for this information. Your personal experiences with the differences, as you see them, reviewed would be a valuable addition to the material provided. I don’t go to the movies a lot. At all. Been years since I went but there was no way in hell I was missing Infinity War. Nope. I grew up on Marvel and have spent a lot of time, energy and money on it and the MCU (all 10 years of it so far). I know I’m not alone when I say I wanted to see the movie in the best way I could afford. But not 3D, f that. I ended up seeing it in XD, which was great. Screen was huge but not intimidatingly so maybe because of how the seats (super comfy) were positioned. The sound was of course great, not over powering or distracting in my opinion. Over all I was impressed (worth the money considering how expensive it is no matter how you see it) but again, I don’t go to movies but once a year or less. I definitely want to experience the differences for myself now. I encourage you to add to your article. I believe many people could benefit even more with your reviews added to the already informative content. I hope for the best for you and your work.